Description: The Discussion: Jeni’s bizarrely decided that a holiday is preferable to being locked in a bunker with two megalomaniacal Martians, so you’re left with an exhausted Paul and a jetlagged Ralph this month. What could go wrong? We discuss outreach at science festivals and a happy resolution to the light pollution issue in the Brecon Beacons dark sky reserve. Have astronomers discovered the smallest possible star? 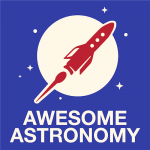 Astronomy You’ve Probably Never Heard Of: This month we give Paul’s festering Hat of Woo and airing as we kick start another occasional feature looking into the science progress in areas (or astronomers) you’ve probably never heard of. This month we look at cosmology and the expanding universe from the perspective of the much-overshadowed astronomy giant, Vesto Slipher. “Let’s say we build a spaceship which contains a massive wheel which rotates to generate 1G. If you are standing on the inside of the outer wall of the wheel, you will be rotating at the same speed as the wheel and therefore feel the 1G. (Like you see in 2001 – A space Odyssey). So the artificial gravity is only created by the rotation and centrifugal force and not by the distortion of space time due to a massive body. Now what will happen when I jump? When I jump up, I am no longer connected to floor of the wheel. What happens to me? As I understand it, I should start to float inside the wheel, like they do in the ISS. The reason is that the centrifugal force generated by rotating wheel no longer applies to me as I am longer connected. If this is the case, then you better never run inside the wheel (running means you will have both feet of the ground between steps) and most likely need to wear Velcro shoes to ensure you stay connect to the floor of the wheel. Am I missing something as a lot of proposed interplanetary spaceships include some sort of wheel to generate artificial gravity? Your humble listener and collector of your podcast posters.